For elderly people, getting exercise is easier said than done. Have you ever been frustrated by the well-meaning but clueless comments and suggestions by younger people who want to encourage you to exercise? Why don’t you just stay active? Don’t you think it would help if you worked out more? Couldn’t you just take some time every day to walk or to do some exercises? When you hear these comments, you may want to shake that person by the shoulders and exclaim, “It’s not that simple!” However, instead, you probably bite your tongue and nod and smile and let them go on suggesting helpful tips to you. Here at LifeStyle Change at 75, I understand completely. I was 75 years old when I began my journey to transformation of my fitness and my health. I know that it isn’t easy. 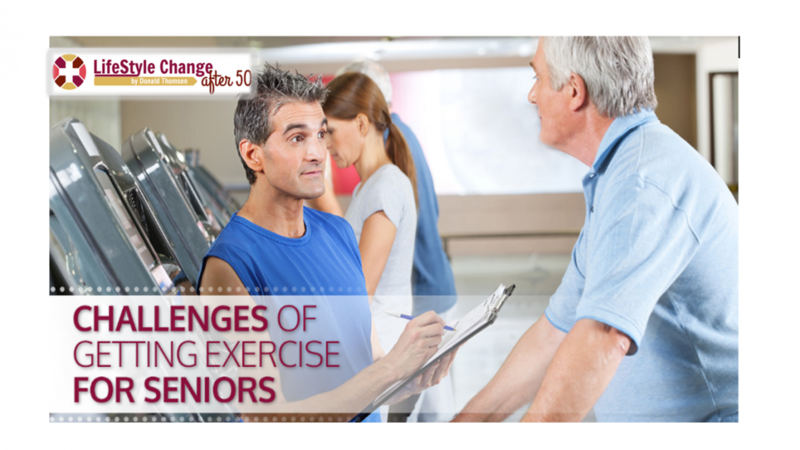 Here are just a few of the difficulties that seniors face when it comes to getting the exercise they need. When you have massive fatigue, it’s hard for younger, energetic people to appreciate that just simple tasks like making coffee or taking a shower may take up almost all of your energy budget for the day. You get older and your energy levels decline, and suddenly you just don’t have it in you to make the effort to work out. With the accumulating health problems that inevitably come with age, you’ll probably find yourself on medications for blood pressure, cholesterol, and other issues. However, these medications come with side effects, and that can pose a problem to you. You may not even notice it at first, but there’s a gradual loss of a feeling of well-being that leaves you unmotivated to exercise. It’s no joke to grapple with the effects of conditions like osteoporosis, muscle atrophy, and declining visual acuity that leave you struggling to maintain your balance. Perhaps you had an extended hospital stay that left you weakened, or perhaps a combination of factors has contributed to making you much less able to do basic things than you used to be. It’s no surprise that when you have serious, legitimate obstacles in the way of your ability to exercise, you’ll feel much less motivation than you’d wish to when it comes to the thought of exercise. While the mental game is a real thing for any athlete of any age, it becomes an almost insurmountable challenge when you’re older. Finding a viable method to turn “I can’t” into “I think I can” to “I did it” is a big deal. Fortunately, when you sign up for 3 Step Fitness/Wellness Program, you’re not getting a program that is made by a clueless, well-meaning young person. You’re getting my video series that addresses all the obstacles you face, because I understand them. I’m nobody special — I’m like you — and if you need the guidance to a transformation that works for elderly people, just start the video series. It’s absolutely FREE to start your membership, and you’ll get access to my first three videos that will get you started to YOUR transformation.